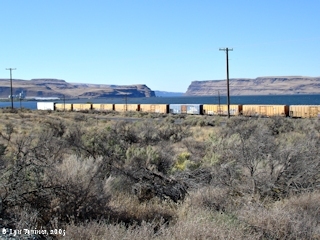 Click image to enlarge Wallula Junction from Highway 730, Wallula Gap. 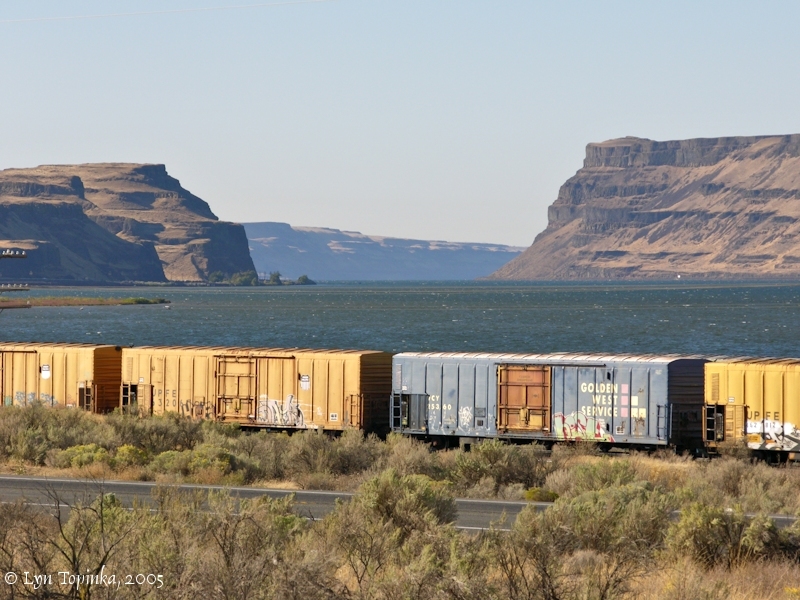 Looking at the Port of Walla Walla between basalts of the Wallula Gap. Image taken September 25, 2005. Today's town of Wallula is located on the left bank of the Columbia River at River Mile (RM) 316, upstream of the Wallula Gap and the Walla Walla River, and approximately 20 miles downstream of the junction of the Snake River with the Columbia. Badger Island and Crescent Island lie offshore with the location of Yellepit across the river. The Port of Walla Walla (more information below) is upstream at RM 317. On October 18, 1805, Lewis and Clark and the Corps of Discovery left their camp at the junction of the Snake River with the Columbia. 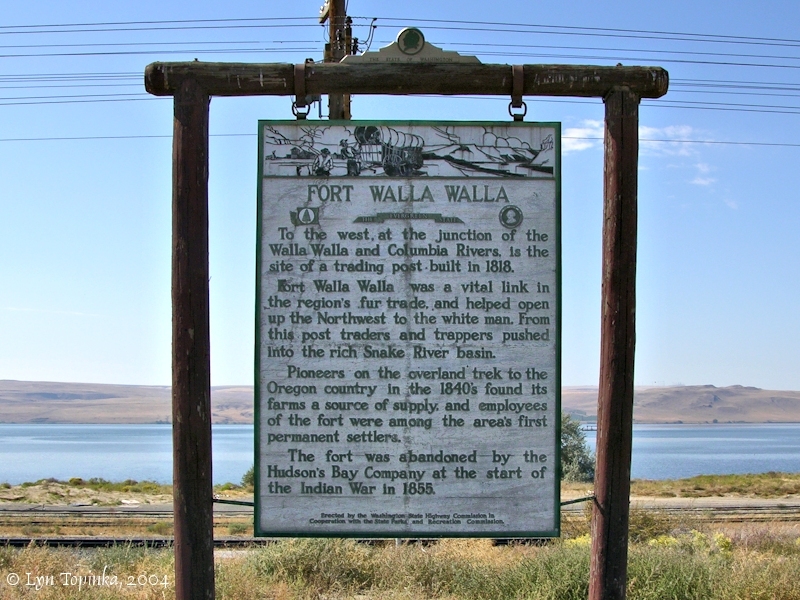 They passed the Wallula location, a spot which would later become the location of Fort Nez Perce, Fort Walla Walla, and the town of Wallula, Washington. This was the beginning of their journey down the great Columbia. The men would spend the night at Spring Gulch, five miles downstream of today's Wallula. According to Robert Hitchman in Place Names of Washington (1985, Washington State Historical Society), "Wallula" has the same meaning as "Walla Walla" in the Nez Perce language, meaning "plenty of water" or "place of many waters". Between 1818 to 1857 the location around todays Wallula was occupied by fur trading posts and forts owned successively by the North West Company and the Hudson's Bay Company. 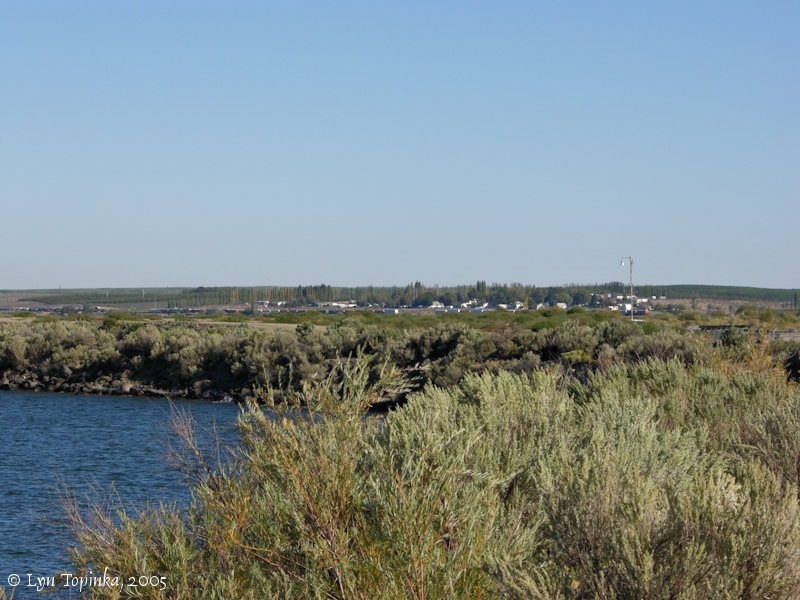 A river town called "Wallula Landing" was established in 1858. The 1861 cadastral survey (tax survey) for T7N R31E Section 27 shows the Walla Walla River and to the north the "Old H.B. Ft. Walla Walla and the name "J.M. Vansyckle & Co." right next to it, and slightly above the name "Walula". In March 1862, the first town of Wallula was named and platted by James Milton Vansyckle and Seth W. Tatem on the site of the original Fort Nez Perce and Fort Walla Walla. It became an important steamboat landing for journey to the Idaho and Montana gold fields. The U.S. Bureau of Land Management General Land Office Records (2007) show John M. Vansyckle begin granted title to 159.75 acres of T7N R31E, Sections 27 and 28, on April 1, 1865, under the 1820 Sale-Cash Entry. In 1882 the Northern Pacific Railway built through the area and a railroad town called "Wallula Junction" was built one mile to the east. Both Wallula and Wallula Junction were inundated by the rising waters of the reservoir behind the McNary Dam. In 1952 a new town of Wallula came into existence on high ground on the east side of the highway, with a view of Wallula Gap. 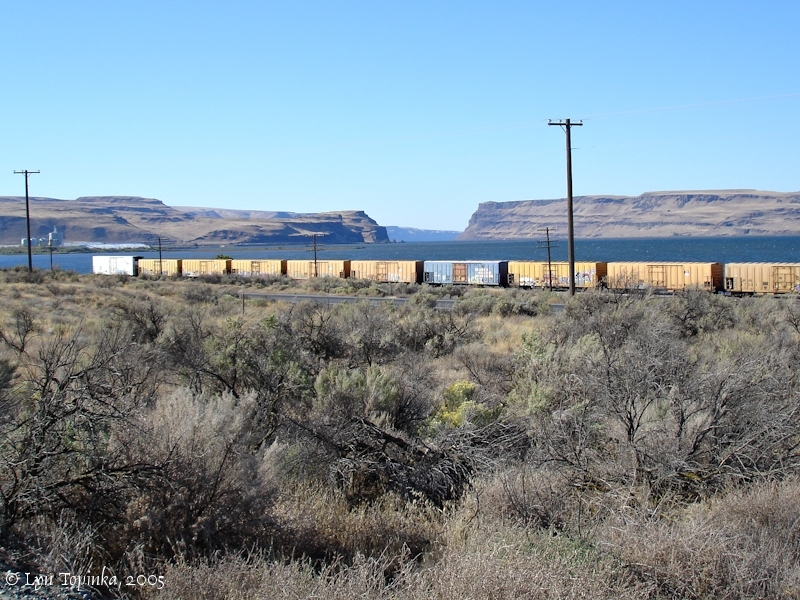 Click image to enlarge Wallula Gap basalts, with the Port of Walla Walla, Wallula, Washington in the distance. Right bank, as seen from Highway 730. Image taken September 24, 2005. 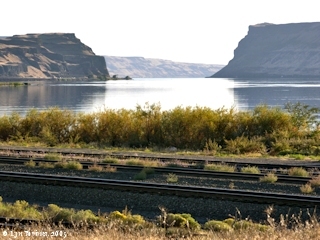 Click image to enlarge Wallula, Washington, from downstream. Right bank, as seen Highway 730. Image taken September 25, 2005. Fort Nez Perce (also called "Fort Numipu", the Nez Perce name for themselves meaning "The People") was constructed in 1818 by Donald McKenzie, a fur trader with the Montreal-based North West Company. Fort Nez Perce was located on the left bank of the Columbia River six miles below the mouth of the Snake River and 1/2 mile above the mouth of the Walla Walla River. This was the original "Fort Walla Walla", often today referred to as "Old Fort Walla Walla", and is not to be confused with three later military-based Fort Walla Wallas built around the community of Walla Walla. The 1818 fort was a combined fort and fur-trading post. Today, a historical marker, made from the actual stones from Fort Walla Walla, has been erected at a highway turnout on Highway 730 near the site. 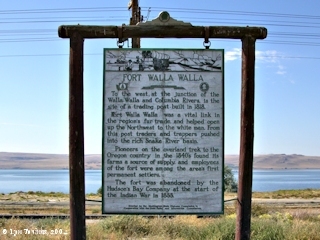 Click image to enlarge Sign, Fort Walla Walla, Wallula, Washington. Image taken September 26, 2004. 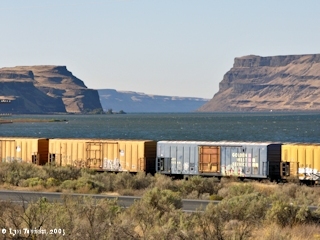 The Port of Walla Walla operates no public facilities, but leases property at Wallula Junction. 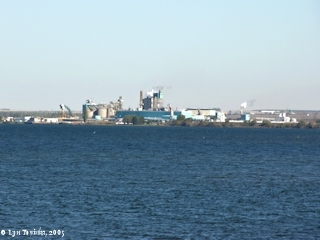 A grain elevator, warehouse, and chemical company are located there. Click image to enlarge Port of Walla Walla, Wallula, Washington. View from downstream. Image taken September 25, 2005. Between 1879 and 1935, and again from 1948 to 1955, a ferry across the Columbia River operated in the Wallula area. "Jehu Switzler started a horse-powered Switzler Ferry in 1879 and the Switzler family ran a ferry across the Columbia until the Wallula Cutoff Road opened in 1935. In 1948, ferry runs started again, transporting dam workers until a bridge from Umatilla to Plymouth opened in 1955." Source: Center For Columbia River History website, 2016. Wallula to Burbank to Pasco to Kennewick, crossing the Snake River at Burbank and Columbia River at Pasco. All Ferries Make Day or Night Crossings. Source: "Western Motor Car", August 1915, vol.VII, no.3. "From Finley to Hover, five miles, is a fair dirt road, and three miles below Hover is the ferry leading across the Columbia to Wallula." 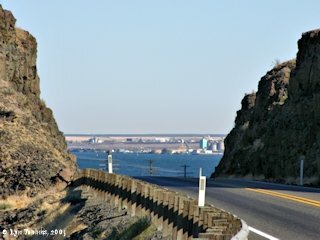 Wallula, Washington, lies on the upstream end of the Wallula Gap, and good views of the Gap can be seen. The small Crescent Island lies off the shoreline from Wallula, with Badger Island slightly upstream. Many islands use to exist before Lake Wallula waters covered them. 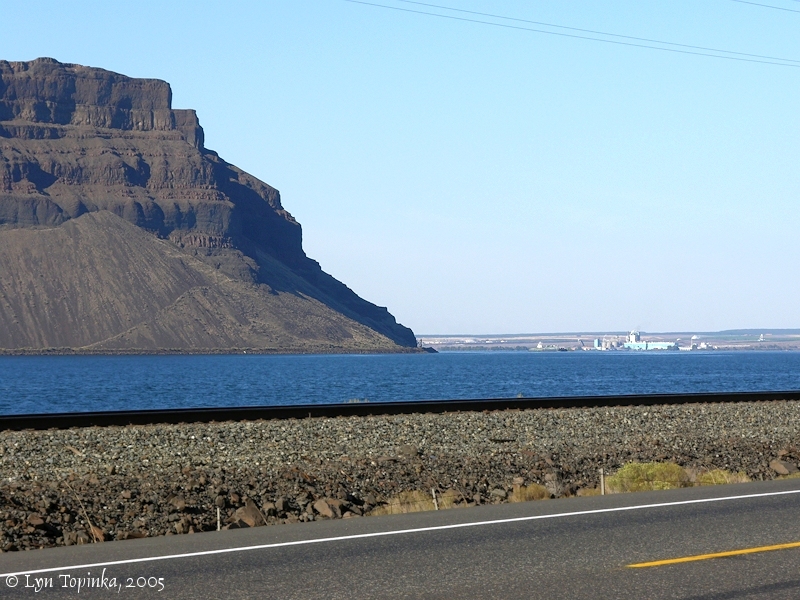 Click image to enlarge Wallula Gap as seen from Wallula Viewpoint, Washington. Image taken September 24, 2005. Click image to enlarge Wallula Gap as seen from Wallula, Washington. Image taken September 25, 2005.
at 16 miles from the point [junction of the Snake River with the Columbia, location of today's Sacajawea State Park] the river passes into the range of high Countrey at which place the rocks project into the river from the high clifts [Wallula Gap] which is on <both> the Lard. Side about 2/3 of the way across those of the Stard Side about the Same distance, the Countrey rises here about 200 feet above The water and is bordered wth black rugid rocks [Columbia River Basalt], at the Commencement of this high Countrey [Wallula Gap] on Lard Side a Small riverlet falls in [Walla Walla River] which appears to passed under the high County in its whole cose Saw a mountain bearing S. W. conocal form Covered with Snow [Mount Hood, Oregon]. passed 4 Islands, at the upper point of the <first> 3rd is a rapid, on this Island is two Lodges of Indians, drying fish, on the fourth Island Close under the Stard. Side is nine large Lodges of Indians Drying fish on Scaffolds as above [Yellepit area]; at this place we were called to land, as it was near night and no appearance of wood [Lewis and Clark are in the Port Kelley area, where today the islands offshore are under the waters of Lake Wallula. ], we proceeded on about 2 miles lower to Some willows, at which place we observed a drift log formed a Camp on the Lard Side [Spring Gulch] under a high hill nearly opposit to five Lodges of Indians; Soon after we landed, our old Chiefs informed us that the large camp above "was the Camp of the 1st Chief of all the tribes in this quarter [Chief Yellepit], and that he had called to us to land and Stay all night with him, that he had plenty of wood for us &" This would have been agreeable to us if it had have been understood perticelarly as we were compelled to Use drid willows for fuel for the purpose of cooking, we requested the old Chiefs to walk up on the Side we had landed and call to the Chief to come down and Stay with us all night which they did; ... we made 21 miles to day.